I responded to a tweet asking for bloggers to review products from MyChelle Dermaceuticals. I discovered the brand a few months ago when I read a review on skinsmatter.com. "Founded in Colorado 12 years ago, MyChelle Dermaceuticals’ singular obsession has been to create the most effective, nontoxic skin care products in the country. Today, MyChelle is the #1 brand of facial skin care in the natural products industry simply because our products deliver powerful, quick and visible results without using nasty ingredients or toxic chemicals." I was sent three products but only one stood out to me and that was the Magnolia Eye Gel (£26 – 15ml). The gel formula sinks into skin after a few minutes. I see a visible difference in the appearance of my dark circles and my eye area feels refreshed and awaken. I can not say that I have noticed a dramatic difference in my dark circles diminishing over time but this worked well as a cosmetic product to perk up eyes first thing in the morning. My before pictures did not come out due to poor lighting but I did include the 'after' picture above. Normally the inner corner of my eye will be more prominent and darker. "A blend of peptides and plant extracts sheds light on even the darkest under-eye shadows and sends bags packing. Eyeseryl® Peptide strengthens weakened capillaries and supports the release of excess fluid responsible for dark circles and puffiness. Green Coffee stimulates and revives while Magnolia Leaf Extract helps strengthen and promote repair for a well-rested look." The packaging promises products to be free from harmful ingredients such as parabens, phthalates, ureas, petroleum based chemicals and artificial colours. Lonicera Japonica (Honeysuckle) Flower Extract is used by the brand and I know it is a widely debated ingredient. Full ingredients are visible on the website. This will always get my praise as it is an important part of online shopping to be able to find this information, especially when you have allergies. As I mentioned there were two other products which left me a little underwhelmed. The Ultimate Lash & Brow (£39 – 15ml) promises "Thicker, fuller, more beautiful-looking lashes and brows in as little as two weeks!" I am blessed with full and long lashes so this was a bit lost on me but I am sure it may appeal to other consumers. The Pure Harmony Mask (£21 – 35ml) sadly did not get past the patch testing stages. You may have seen me tweet a picture of this bright blue face mask. It was a little off putting but it does turn translucent on contact with skin so you do not end up looking like a smurf. Overall, MyChelle is an interesting brand with a wide range of products suitable for different skin types. Are you familiar with the brand? Have you tried any products? Shame that two of the products didn't "float your boat" - I was very happy with the peel I tried. This eye cream looks great and its amazing that its had an effect on your dark circles. I will recommend that to my sister. The face mask looks like toothpaste to me! LOL at your Smurf comment! I have reasonably long lashes but I am never happy and want even longer lashes so at some point I might try the lash/brow product. I also highly rate MyChelle for having their ingredients on the site! Thumbs up! I thought of toothpaste when I saw the mask too! 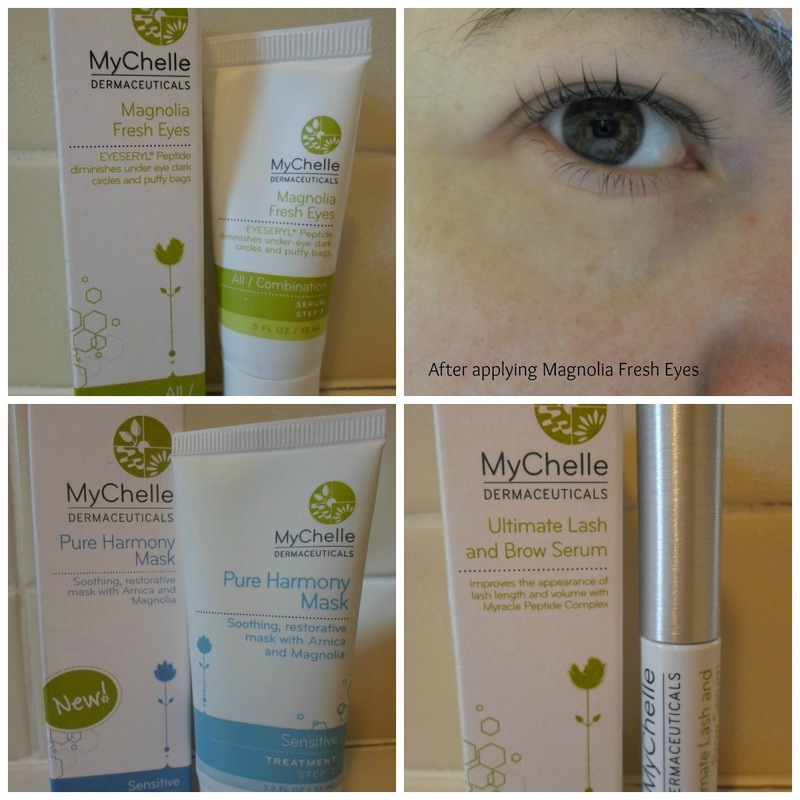 The eye gel sounds great...it can be so difficult finding eye products that make a visible difference. My problem with MyChelle has always been how heavily fragranced the products are. I know their scents are natural and I'm not sure if it's true of the entire line, but everything I've tried has been very strongly scented. Now you mention it I guess the eye gel has a strong fragrance, difficult to say because everyone is different but I understand your concerns. The colour of the mask was alarming given that they use natural ingredients. I have their concealer.Great ingredients but not so good in concealing dark eye circles..